Be a part of the TAR team! Benefits of working on-campus include: getting paid, gaining experience, building connections, and much more! 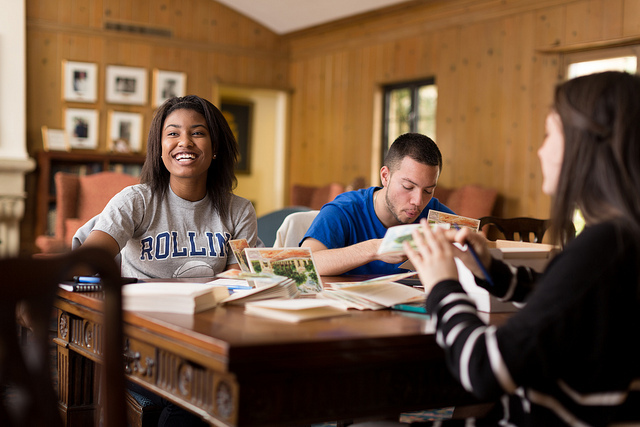 There are 3 types of on-campus employment at Rollins for undergraduate students: Federal Work Study, Frueauff, and Department-Funded student positions. The main differences revolve around the funding source and student eligibility. As for graduate students, the on-campus employment opportunities include 2 position types: Graduate Assistantships and Department-Funded positions. The eligibility criteria differ according to department needs and students course of study. Federal Work Study (FWS) is a federally-funded financial aid program awarded to students based on their eligibility determined by the Free Application for Federal Student Aid (FAFSA) along with other financial aid criteria. Funding for this program is limited. Students are awarded a specific amount, and the federal government subsidizes the wages to the employer. This means that Rollins pays a portion of the wages and FWS pays the remaining portion. Federal Work Study positions are available only to those students who have received communication from the Office of Financial Aid and/or the Center for Career & Life Planning regarding their work study eligibility for the current academic year. If you have not received this communication, you are not eligible for Federal Work Study positions. The receipt of a financial aid award does not guarantee a job. Frueauff student positions are funded through the Charles A. Frueauff Foundation Student Employment Fund. International students as well as US resident students who meet the financial aid criteria, may apply to these positions. Frueauff positions are available only to those students who have received communication from the Center for Career & Life Planning regarding their eligibility for the current academic year. If you have not received this communication, you are not eligible for Frueauff positions. Students without federal funding can find jobs across campus. Rollins departments pay in full for these students' wages. All Rollins students are eligible to apply for these positions, regardless of financial need. Questions? Email us at studentjobs@rollins.edu or call us at 407-646-2195/2382. For available positions, sign in to Handshake using your full Rollins address and password. Click on Jobs and select “On-Campus" as the job type. New positions will be posted daily starting on July 24, and continue throughout the school year. Note: Work Study & Frueauff positions are only available to students who have received communication indicating their eligibility. Ineligible students will be declined from the Work Study/Frueauff applicant pools. Feel free to reach out if you have any questions regarding your eligibility. Call 407-646-2195/2382, or email us at studentjobs@rollins.edu. After finding a position you wish to apply to, click the green “Apply” button to the right side of the job posting. Ensure that you upload the job-specific required documents, examples include: resume, cover letter, class schedule, etc. Remember to hit the blue “Upload” button to upload a new file. You will receive an email notification confirming your submission. Make sure to keep an eye on your email for possible requests for interviews. It may be a few weeks before you hear back about your application as departments have many applications to review, so don’t let this discourage you or keep you from applying to other positions. Remember, the more you apply, the higher your chances of being hired! NOTE: Once you accept a Work Study or a Frueauff position, your applications to other Work Study& Frueauff positions will be declined. Students should review the handbook before applying for a job on campus, and throughout their employment with the College. This tool will help you make the most out of your on-campus employment experience. Before starting to work in an on-campus job, students must visit the Center for Career & Life Planning (CCLP) to complete the necessary new hire paperwork listed below. Note: U.S. resident students are required to complete their new hire forms only once during their college career. International students are required to update their tax information annually and connect with CCLP regarding status, visa, and related updates. • I-9 Form - To be completed in person by visiting the Center for Career & Life Planning. To complete this form you must present CCLP staff with original/unexpired documents: either one document from List A, or a combination of one document from list B and one document from List C as presented in the List of Acceptable Work Documents. Be sure to review these instructions for more information, and get started on completing your I-9, via this fillable form. • W-4 Form - Complete the personal allowance worksheet and fill out the withholding allowance information at the bottom of the page. • Worker's Compensation Form - Read thoroughly, then sign and date the form. • Employee Pay Selection Form - To be completed in person by visiting the Center for Career & Life Planning.Be sure to bring your bank account information necessary for your direct deposit selection: account and routing number. • Confidentiality Statement - Review FERPA FAQs, then sign the form. • Student Title IX Online Course - Student employees are required to complete the Workplace Harassment:Fundamentals course. Be sure to register to your UEEdurisk account, complete the course, and return your completion certificate to CCLP along with the rest of your new hire documentation. You may also email the completion confirmation/certification to studentjobs@rollins.edu. Questions? For more information review our FAQs document. Before starting to work in any on-campus job, international students must visit the Center for Career & Life Planning to begin their non-resident employment procedures. Please be aware that the onboarding process is lengthy, and preparing ahead is highly advised. Review and complete the steps and paperwork highlighted in the NRA checklist. - Have legal non-immigrant status that allows for on-campus employment. - Maintain full-time student status. - Have a Social Security Number in order to get paid. - Complete the non-resident employment procedures highlighted in the checklist above (including the FNIF Form). NOTE: International students are required to update their tax information annually, and connect with CCLP regarding status, visa, and related updates. - F-1 Students may start working on-campus immediately after completing new hire paperwork. - J-1 Students must have their on-campus position approved by the Office of International Student & Scholar Services prior to starting their work on-campus. - International Students are not eligible for Federal Work Study funded positions. - Undergraduate International Students are eligible for Frueauff positions.